Blurb: Cynthia’s dreams are so real, they are actually coming true – complete with the prerequisite dream guy. But things are not as they seem. Who said dreams are sweet? Chicago businesswoman Cynthia Courtland is completely focused on her career when a sensual, reoccurring dream disrupts her orderly life. Then a threat against her workplace forces her to take time off. She is lost with nowhere to go--only her empty apartment. Work is Gabe’s life too; he takes it very seriously and will do whatever it takes to succeed. He's been watching over Cynthia for a long time and he has her best interests at heart, but can he protect her from the danger she is blind to? When Cynthia insists on investigating the threat so she can get back to work, it makes Gabe's job all the more difficult. When things settle, will there be more for them than a life filled with work? Will she give her dreams a chance to come true? Maya Tyler is the author of Dream Hunter, her debut novella. Being an author is her lifelong dream. Her day job is in Finance, but she spends her free time writing paranormal romance novels and blogging at Maya’s Musings. 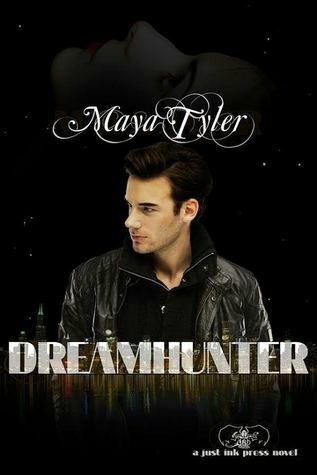 She loves visitors and you can contact her anytime at www.mayatylerauthor.com. The air in her lungs rushed to escape and time stood still. She was aware of only him. Beyond her control, her head tilted and her whole body leaned toward him; her inner core pulsed and buzzed. He drew her in like a magnet, a moth to flame; she was helpless to resist his siren call. He emulated danger, looked like evil incarnate—black and dangerous, seductive and forbidden—and she wanted him. When he grabbed her harshly by both shoulders, she snapped out of her lust-induced trance. “What do you think you’re doing?” she demanded. “We must get out of here.” His words were calm, but his eyes stared right through her. Cynthia opened her mouth to object. “There is no time,” he announced as he tugged on her arm. Holding her arm still, he stared into her eyes without saying a word. She opened her mouth to protest again. Should I go with him? She tilted her head and looked up at him. His gaze was strong and steady and made her feel safe. This is not the time to be indecisive. She thought about the threat at work and shivered despite the heat. You will be safe with me. There is no time. We must leave now. His voice entered her thoughts like a caress in her mind and didn’t alarm her. He was right. There was no time to analyze her options and run through various scenarios. For all she knew, every scenario without him could mean danger for her. Her body wanted to follow him, she admitted with reluctance, even if her mind resisted. Yes, she would go, she decided, even as she felt herself following him down the street. Power resonated from his muscular build. He kept a hand in a firm but gentle hold on her elbow as they hurried down the sidewalk. Unmindful of their destination, Cynthia had ample time to study her new “friend.” He towered over her by at least a foot, wearing a black leather jacket despite the warm day, and dark jeans that showcased his narrow waist. Every beefy inch of him screamed passion and strength—his tight clothing doing nothing to disguise the sinewy muscles rippling in his legs as he moved—but she wasn’t frightened of him. She hesitated for a minute. Should I be afraid? No, she decided. She felt eerily calm, like all her life had been leading her up to this moment in time, and she was exactly where she was supposed to be. The reason she let a perfect stranger lead her to God-knew-where. She shifted her thick hair over her shoulder as sweat soaked at the base of her neck. The day’s temperature had yet to peak, but it was already warm enough to be uncomfortable and practically running in office attire didn’t help matters. “I need a moment,” she said. They made an abrupt stop. The man offered her an unopened bottle of water. After casting an assessing look at him she accepted the bottle, and took a long, welcome drink. The man dismissed her thanks with a casual shrug. Cynthia shot him a questioning look. “We need to go,” he repeated, ignoring her question. They had covered several blocks and, as they moved further from her office, the sights became less familiar and a tremor of fear shook through her body. Where did this guy come from? Why does he think I know him? Because I do know him. The realization hit her hard in the stomach. It’s him. “We need to keep going,” he insisted without further explanation. “No!” She planted her hands on her hips and her feet in the firmest stance she could manage as she wobbled on the uneven sidewalk. Then she looked down at her feet and a strange sense of déjà vu washed over her as she stared at the cobblestone path. Her mouth gaped, her breathing quickened. With dread she looked up at the buildings on the street. Her vision blurred. Everything around her spun and faded away as she collapsed into strong arms. She had a vague awareness of him lifting her. As he adjusted his hold, she bounced against his solid chest. She must be dreaming. That was the only explanation that made sense. Nothing like this ever happened in her boring, ordinary life. It’s just a dream. Swallowing her disappointment, she glanced up at the determined expression on his face. He carried her effortlessly, like she weighed nothing. When she rested her head on his chest, she could feel his heart beating steadily. She ran her hand lightly across his defined bicep. Wow. He wasn’t real, but she might as well make the most of it; from experience she knew her dream wouldn’t last forever.